Eucomis, commonly known as Pineapple Lilies or Pineapple Flowers, are summer-blooming bulbs with exotic flowers. The long, strappy leaves may be green or burgundy, and the stems are sometimes freckled with contrasting colors. Pineapple Lily flower colors can be white, pink or violet. Pineapple Lilies have attractive foliage as well as interesting flowers. The plants typically grow 18 to 24 inches (45 to 60 cm) tall and equally wide. This makes them suitable for edging a walk or pathway. They are also good accent plants for the front or middle of a flowerbed. 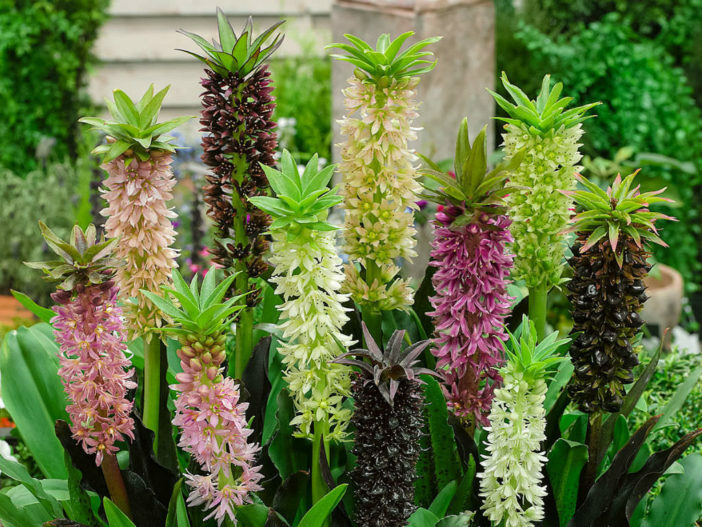 Eucomis are native to South Africa, where they typically grow in open, rocky areas. Rock gardens are ideal for Pineapple Lilies because they give the plants the sharply drained soil they prefer. They are easy to grow and their long-lasting flowers and attractive foliage are always an exciting addition to flowerbeds, borders and containers. In northern zones, Pineapple Lilies grow best in full sun. In areas where the sun is more intense, the plants appreciate a little shade during the hottest part of the day. They are winter hardy in hardiness zones 7-10. In colder areas they may be grown as annuals, or the bulbs can be stored indoors during the winter for replanting the next spring. Eucomis bulbs should be planted outdoors in spring after all danger of frost has passed. For a head start, you can plant the bulbs in pots indoors about a month before they are planted outside. Pineapple Lilies grow well in pots and planters. Pineapple Lilies look exotic, but they’re actually very easy to grow. Simply plant the bulbs in spring after all danger of frost has passed. Wait until the soil temperature is 65°F (18°C) or warmer, as Eucomis bulbs will not grow in cold soil. It typically takes 3 to 4 weeks for the plant’s leaves to begin emerging from the bulb. Grow Pineapple Lilies in loose, well-drained soil. Heavy or soggy soil may cause the bulbs to rot. At the start of the growing season, it’s best to keep the soil barely moist. Once the plant has several leaves, start watering consistently, keeping the soil relatively moist until after flowering. In late summer, flower stalks emerge from the center of the plant and will rise to a height of 12 to 18 inches (30 to 45 cm). Each flower is a column of florets, crowned with a topknot of tiny leaves. The florets open slowly from the bottom up, over a period of 3 weeks or more. After the petals drop, they are replaced by attractive seed capsules. A dose of liquid fertilizer every 2 to 3 weeks will help keep Eucomis plants lush and vigorous. Pineapple Lilies are dormant during the winter months. This is true even in zones 7-10 where the bulbs are winter hardy. If you want to store the bulbs indoors, cut off the flower stalk after flowering and allow the foliage to continue growing until it either dies back naturally or is at risk of being frosted. If the bulbs are in the ground, dig them up and gently remove the soil from around the bulb. Let the plant dry in a warm, protected area until the foliage has withered. If your Pineapple Lilies are in pots, just bring the pots indoors. Store the dormant bulbs at 45 to 50 °F (7 to 10 °C) until it’s time to replant them in the spring.